I grew up with soups. I mean, I didn’t eat only soups, heck I wouldn’t have gotten to 6’3″ with that kind of nourishment, but some sort of sour soup was a staple in our home. My mom still loves her bowl of hot soup during almost every lunch. Me, on the other hand, back in the day, I was more interested in steaks and sausages but when you are at a certain age is very difficult to escape your parents meal plan, so I went on with the pack, so to speak. Time has passed though and I finally bought my first grill. Not just now, for crying out loud, it’s been a while. Few years back, I thought I should see what vegetarians are talking about and become one. I managed to stay away from meat for at least a year but in the end I gave up. Nothing to write home about so I went back to my grill. Pretty cool but what I am trying to say is that is very difficult to escape your parents conditioning, I still like a bowl of hot soup every once in a while. Fortunately I learned to enjoy sweet soups as well and not only sour, which finally takes me to my post today. I don’t really like eating the same thing twice, at least not too often anyway, which makes me be on constant look out for new recipes or food combinations to try. With wife’s work and blogging, time is pretty limited which means I have to do my own gastronomic experiments. Finally, my searches (and wife suggestion) led me to Tuscan soup or zuppa Toscana, which looked pretty good and made me want to try it. There are a ton or recipes on the web if you search for it and all of them have pretty much the same recipe as point of departure so if you feel the need to receive credit, good luck. 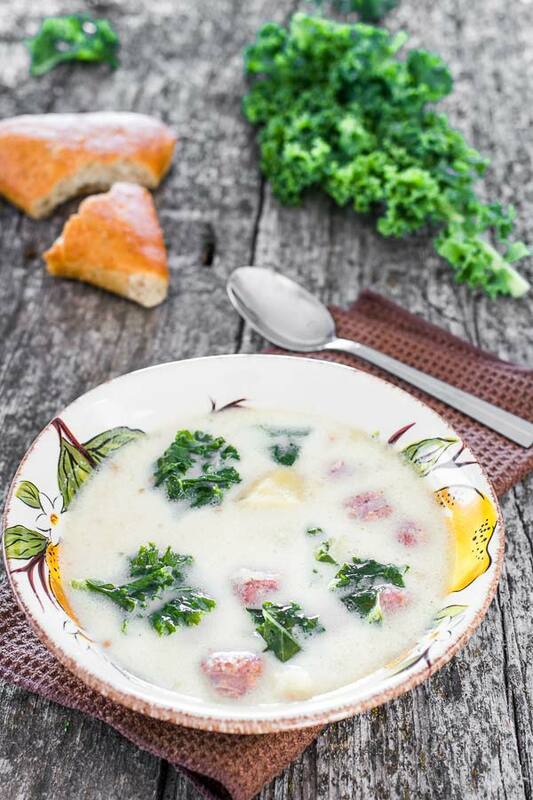 I have also been searching to find out some lore about zuppa Toscana but there is nothing, just an ingredient list. You can find more information about Ribollita, also a Tuscan soup, but it is totally different than this one. Finally I had second thoughts about using sausages in a soup but I am usually very curious (if not brave) and I went on with it and I must say, it came out delicious. Ok, one last bit. The recipe I found asked for kale or swiss chard and since I liked them the same, I used both of them. Enjoy! Add a couple of tablespoons of olive oil to your soup pot and brown sausage pieces in it. Add chicken broth and water to pot and stir; place onions, potatoes, and garlic in the pot. Cook on medium heat until potatoes are almost done. Add bacon; salt and pepper to taste; simmer for another 10 minutes. Turn to low heat; add kale and cream and let cook for another 10 minutes.